The Brush tool allows you to draw by creating shapes based on your drawing strokes and filling them with colour or textures. When used with a tablet, it is pressure sensitive, just like a real life brush. NOTE For tasks related to this tool, see About the Brush Tool. 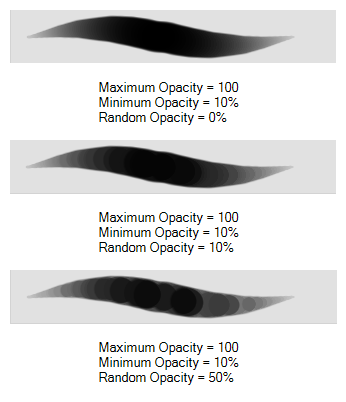 The following properties affect the brush's size, smoothing and other properties for the drawing style of your brush. Those properties can be saved into brush presets for later use. The arrow button right of the preview area opens the Brush Properties dialog. 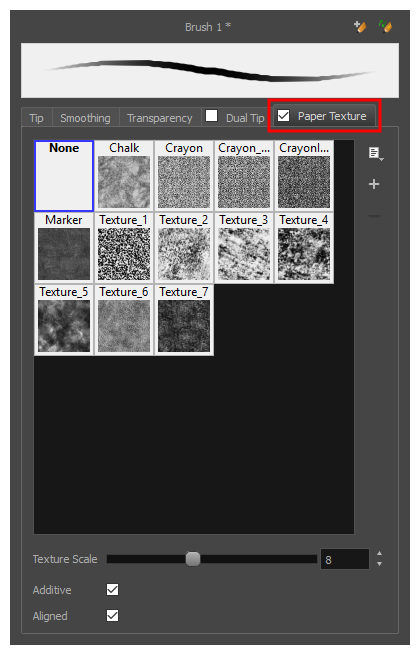 While the Tool Properties view only gives you access to a few of the brush properties, a list of brush presets and other drawing options, the Brush Properties dialog gives you access to all the available options for your brush's tip and texture. For more information on the Brush Properties dialog, see the Brush Properties Dialog section below. Defines the maximum width of brush strokes. NOTE This option is only available when drawing on a vector layer. Lets you set the opacity for each instance of the brush tip that gets printed into your canvas. 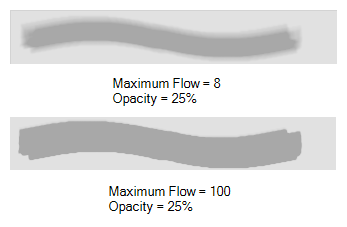 Contrary to the Opacity parameter, the flow parameter has a cumulative effect. This means that a lower flow will make your brush strokes more transparent towards its extremities and more opaque in its center. Your stroke's flow will also accumulate if you draw over it. 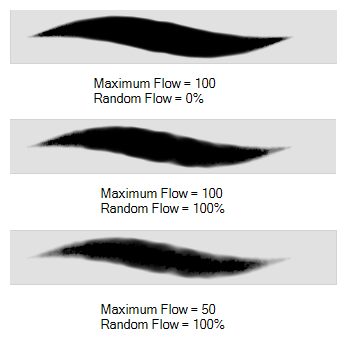 By default, your brush's flow varies with the amount of pressure you put on your tablet pen. NOTE This option is only displayed in the Tool Properties view when drawing on a bitmap layer. 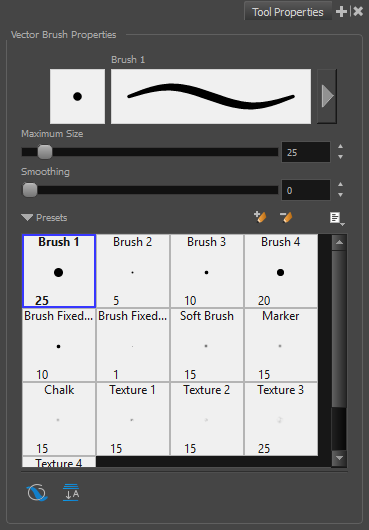 These options allow you to select, create and manage brush presets. By default, Storyboard Pro has preloaded brush presets. 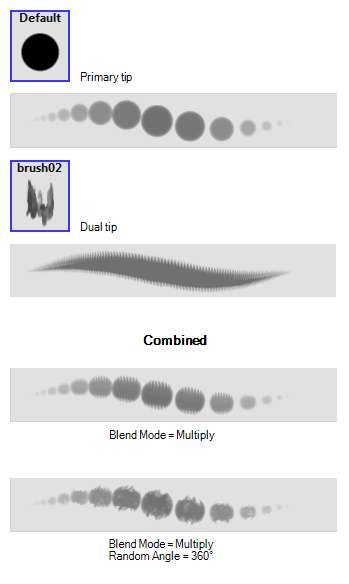 You can also create your own brush presets by configuring your brush, then saving its properties into a new preset. It is also possible to export and import brush presets. 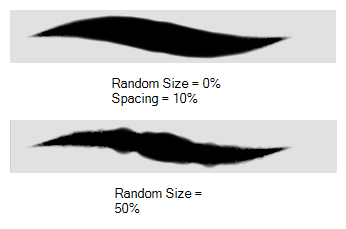 NOTE This option is only available when drawing on a vector layer. When drawing on a bitmap layer, artwork is always flattened. Brushes have an extensive set of options and properties that are not displayed in the Tool Properties view, but rather, in a dialog you can access from it. To open the Brush Properties dialog, click on the arrow button right of the stroke display area. The Tip tab allows you to configure the shape, size, hardness and spacing of your brush tip. Solid Vector Brush: Creates vector shapes filled with a solid colour. Makes artwork lightweight, scalable and easy to tweak. 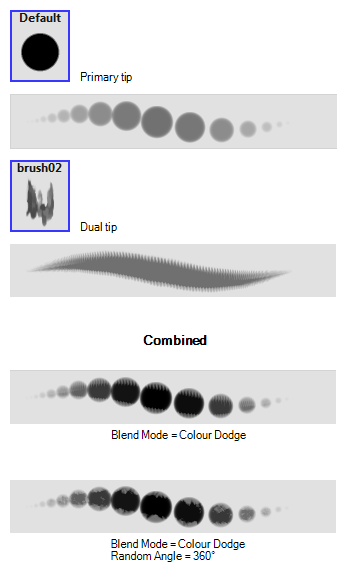 Since this kind of brush can only create solid colour shapes, solid vector brushes have a limited set of options including size, roundness, angle, centerline smoothing and contour smoothing. 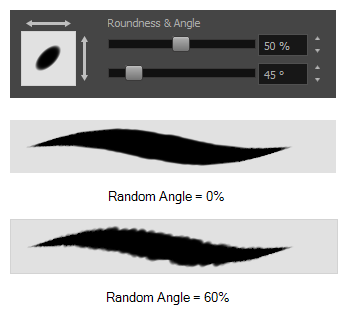 Textured Vector Brush: Creates vector shapes filled with a texture. This gives you access to bitmap brush tips, paper textures, transparency and several other options. NOTE This option is not available when working on a bitmap layer. With bitmap layers, brushes are always textured, and textured brush options are always available. NOTE Setting the Minimum Size value to 100% eliminates the possibility of creating width variation on your stroke. In other words, you would be forcing a uniform line width using the Maximum Size value. Roundness: The vertical scaling to apply to the tip. Reducing this setting squashes the tip vertically, allowing you to turn round or square tips into flat tips. Angle: The angle at which to rotate the brush tip, counterclockwise. The squashing is not relative to the angle—if the tip is rotated, the squashing will still be done relative to the tip's original orientation. 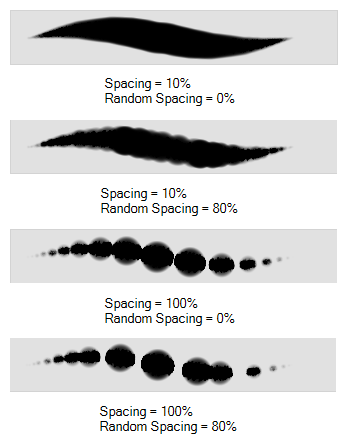 The Randomness parameters let you create a varied brush stroke. Refining these options can give your stroke a lovely, non-mechanical look. NOTE Setting the Minimum Size to 100% eliminates the possibility of creating width variation on your stroke, whether you are applying randomness or not. Therefore, you would be forcing a uniform line width using the Maximum Size value. The Smoothing tab contains options to configure how Storyboard Pro should automatically smooth your brush strokes as you paint. 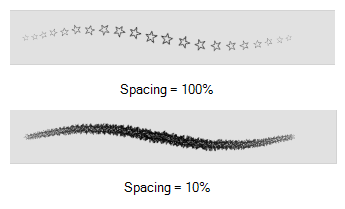 NOTE The Smoothing tab is only available when working on a vector layer, as bitmap layers do not support smoothing. Centerline Smoothing Defines the amount of smoothing Storyboard Pro should perform on your brush stroke's direction, curves and corners. A higher setting will prevent your line from being shaky, but is liable to reduce drawing precision and turn sharp angles into curves. Defines the amount of smoothing Storyboard Pro should perform on outer contour of the brush stroke. A higher setting will round sharp corners and reduce the amount of control points for the resulting vector shape. 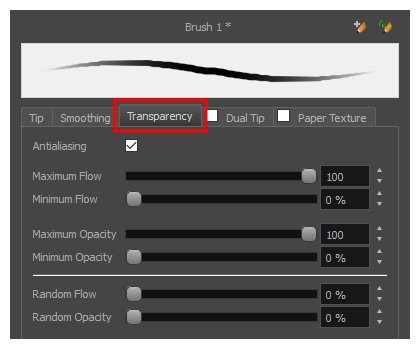 The Transparency tab allows you to decide if your brush has antialiasing as well as to set its flow and opacity settings. NOTE The Transparency tab's options are only available on vector layers if the Brush Type option of the Tip tab is set to Textured Vector Brush. On bitmap layers, those options are always available. Enabled by default. This option causes the contours of the brush strokes to blend with the surrounding colours, to create an illusion of smoothness otherwise not possible due to the picture resolution. 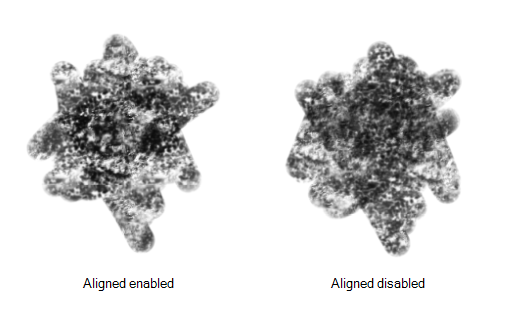 If antialiasing is disabled, the brush's texture will only render fully transparent or fully opaque pixels. Disabling this option can be useful if you need your outlines to be very crisp, if you want to make pixel art or if you need your brush strokes to render in solid colors with no variation, which makes them easier to repaint or process in third party software. NOTE When disabled, all other options in the Transparency tab are disabled. 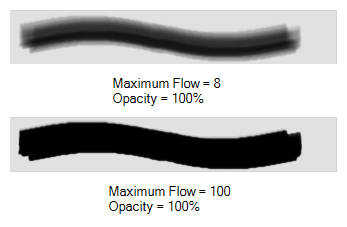 NOTE Setting the Minimum Flow value to 100% eliminates the possibility of creating flow variation on your stroke, whether you are applying randomness or not. That is, you would be forcing a uniform flow using the Maximum Flow value. NOTE Setting the Minimum Opacity value to 100% eliminates the possibility of creating opacity variation on your stroke, whether you are applying randomness or not. That is, you would be forcing a uniform opacity using the Maximum Opacity value. NOTE To use a Dual Tip, you must enable option by checking the checkbox inside the Dual Tip tab. 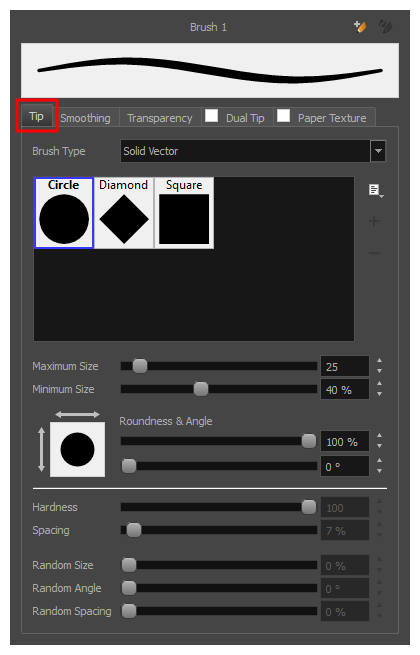 Additionally, if you are working on a vector layer, the Brush Type option of the Tip tab must be set to Textured Vector Brush. 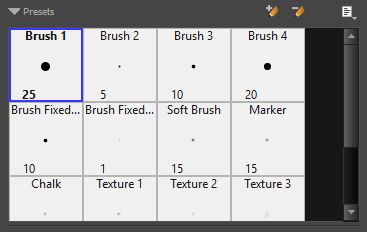 Enable/Disable The checkbox inside the tab allows you to decide whether or not your brush uses a dual tip. If this checkbox is unchecked, the options in the Dual Tip tab will be disabled. 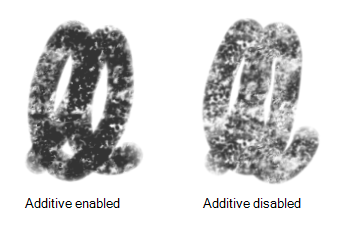 The Paper Texture tab lets you configure a paper-like texture for your brush. You can also add textures by importing image files, or import paper textures that were previously exported from Storyboard Pro. NOTE To use a Paper Texture, you must enable option by checking the checkbox inside the Paper Texture tab. 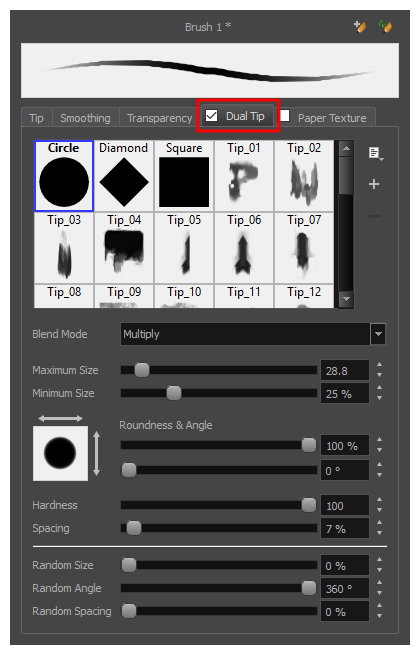 Additionally, if you are working on a vector layer, the Brush Type option of the Tip tab must be set to Textured Vector Brush. 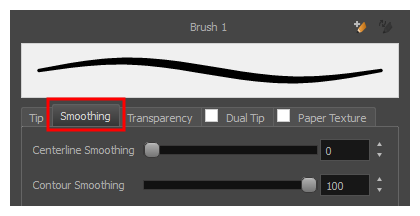 Enable/Disable The checkbox inside the tab allows you to decide whether or not your brush uses a paper texture. If this checkbox is unchecked, the options in the Paper Texture tab will be disabled.